What could Brexit mean for Spanish wine? The United Kingdom is a key market for wine both in terms of figures and its trendsetting power. According to the Wine and Spirits Trade Association (WSTA), the country’s wine trade generates £17.3 billion in economic activity, it is sixth in the world ranking and second in volume only behind Germany. Some believe that Brexit might be a golden opportunity for English wine, especially after research conducted by polling firm YouGov revealed that wine has become the country’s preferred alcoholic drink. Currently, 99% of the wine consumed in the UK is imported. According to the Spanish Institute of Foreign Trade (ICEX), in 2015, the year before the referendum, the value of Spanish wine imports to the UK was €343m. In 2017, however, the figure dropped to €319m. Recent studies such as Wine Nation, conducted by the Australian multinational Accolade Wines, point to a change in consumption patterns: people drink less wine, but of higher quality. It is not only the price increase that matters, but also the effects of alcohol on health. Wine spending is increasing. In British supermarkets, the strongest growth (23.7%) is in the £7 to £9.99 price band. 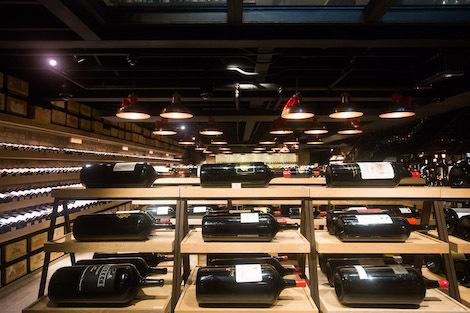 In premium restaurant and catering operations, says supplier Liberty Wines, prices of quality wines increase almost three times faster than in the rest of the industry. In addition to dealing with changes in consumer behaviour and the fall of the pound, wine professionals will face an added challenge from February as wine duty will rise in line with inflation, a measure announced by the Chancellor last October. A supporter of remaining in the European Union, the WSTA is critical of the rise and warns of the first pre-Brexit symptoms. 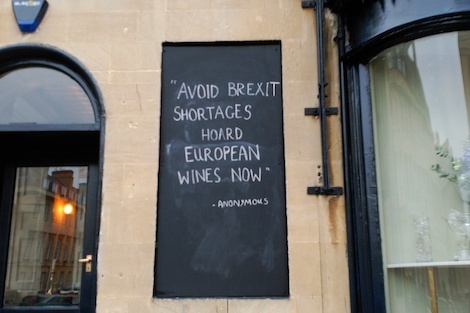 "There is no doubt that Brexit is having an impact on wine prices. The average price of a bottle of wine has risen by almost 30p, since the vote to leave the EU, following the fall of the pound, rising inflation and increasing import costs. The government’s decision to raise wine duty in line with inflation in the Budget in October added further cost pressures, with a bottle of still wine increasing by 9p and sparkling by 12p." For the WSTA, "the duty rise announced in October is grossly unfair, unjustified and counter-productive. The UK is the world’s biggest wine trading nation and, as such, deserves government support, not punishment". The WSTA recently published a road map with suggestions to soften the transition to the new reality. Among its requests, the association stresses the need to retain European production standards in order to maintain consumer confidence and urges the government to keep EU wine imports free from tariffs and to reduce taxes on wine consumption in the UK. What do UK-based Spanish wine specialists think? José Etura is the director of Sabor, one of London’s most renowned Spanish restaurants. Run by chef Nieves Barragán, her work has been recognised with a Michelin star less than a year after opening. As wine buyer, Etura believes that "the consequences of Brexit for Spanish wine will depend on the customs agreement reached and the time it takes. It has already been proved that markets do not like uncertainty. The depreciation of the pound against the euro has made wine much more expensive. On top of this, we still do not know if tariffs will be applied to certain products or if free trade will continue, so making predictions is difficult". Etura does not forecast an easy future for restaurant businesses across the country. "The cost of living will increase because of the rise in labour costs". He also warns that “it is difficult to prepare for what is coming when not even the government agrees. Measures can only be taken when they tell us clearly what we are facing". The paper UK and Global Wine Markets by 2025, written by economists Kym Anderson and Glyn Wittwer predicts that by that year the price of wine for the British consumer will be 22% higher (20% because of the depreciation of the currency, 4 % due to potential new tariffs for European wines and -2% due to negative growth in revenues), volume in consumption 28% lower and a 27% fall in the value of UK imports. Álvaro Ribalta, sales manager at Indigo Wine, an importer specialised in small producers with 40%-50% of Spanish wines on their portfolio, remembers the sudden price hike of a bottle of wine after the referendum: from £15 to £17-£18 in stores and up to £4 or £5 in restaurants. "They were massive increases and it happened overnight. If the deal is unfavourable for the United Kingdom, it would not be difficult for what the study predicts to happen: the pound will continue to fall, taxes will continue to rise, tariffs will appear ... the price of wine could rise 22%". Will quality wine be particularly harmed? “When duty goes up, cheap wines are the most affected because it is an absolute price increase, but the pound depreciation affects all price ranges”, explains Ribalta. “If wine duty continues to rise and tariffs are also implemented, it will affect mostly cheap wine, but I do not think it would be as relevant as the pound’s fall”. Ribalta recognises that the Spanish producers with whom they work are worried. “The United Kingdom is an important market, especially for exposure”. For Ana Gómez, one of the founders of L'Oculto, a wine bar and restaurant in South London, “the great problems of Brexit for Spanish wine will be customs and taxes”. Gómez expects a considerable price increase. “I have decided to buy several pallets before March 2019 because the Treasury has already sent us a letter saying that taxes will be affected from March. I also believe that the customs system is going to collapse, at least for the first few months. France, in fact, is already taking measures and conducting a much more comprehensive control”. Everyone in the same situation? Big companies in the wine industry in the UK are also making some moves. Majestic Wines has stocked a million extra bottles to avoid complications from a possible no-deal Brexit. Alistair Viner, head of purchases at Hedonism Wines, a luxury wine store in London, thinks it is very difficult to know what will happen. “If you ask me next week, my answer might be very different answer. We are exporting quite a lot, so I don’t know whether tariffs will affect us or not. We ship to the US on a daily basis. We ship to Europe a lot and that might be affected. But ultimately, there will still be people wanting to buy wine, and whatever affects us, it’s going to have the same effect on the rest of the industry. Eventually, everyone is in exactly the same position”. 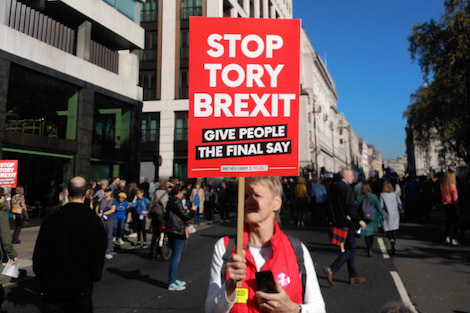 “No one really knows what Brexit will look like if and when it happens”, says Mike Veseth, author of several books on wine, editor of the blog The Wine Economist and Emeritus Professor of International Political Economy at the University of Puget Sound (USA). “The best we can do is informed speculation”. In the words of Veseth, “any sort of Brexit is likely to slow UK economic growth and cause the pound to depreciate. Both of these events would be detrimental to wine imports. UK supermarket chains are already feeling the pain from stagnant consumer demand and rising import costs and are keen to protect their margins by putting the squeeze on suppliers. Spanish wine imports, because they are disproportionately value-priced supermarket wines, may be especially vulnerable as margins tighten”.